1 SÆRLIG JEWEL I 7. FLAVE MED RET VEND, ALMINDELIG, ABSOLUT, KOMFORTABEL, ALLE UDSTYR, 1 SOM MEGET MED 1 REAL SENG TIL 2 + OPHOLD MED SENG, TELEFONSIG FLATSKÆR, GRATIS WIFI, TABEL GLAS OG 4 STEDER + VÆRENDE MODERNE KØKKEN ALLE Udstyret + badeværelse med bad og vaskemaskine + kjole (bord og jern). Tæt på alle indkøb og transport (TRAM, tog til 10MN, buslinje 23 DIRECT LUFTHAVN) .RAPPER OG TÆNDER LEVERET. Excellent accomodation with great views, great for market and transport. It was ideally situated for getting around Nice, being within a short walk to the nearest tram stop. Would recommend buying the weekly ticket for 15 euros each which can be used on the trams and buses within Nice.The proximity to the markets was ideal for buying fresh local produce. Great situation and a great apartment. Wir waren zum zweiten Mal dort. Die Wohnung hat alles was man braucht. Die Aussicht vom Balkon ist wunderschön. Der Wochenmarkt ist direkt vor der Tür. Die Wohnung ist schön ruhig. Mit den Bus 23 kommt man direkt von und zum Flughafen.Mit den Pinienzug,der Bahnhof ist keine 5 min entfernt, kam man schöne Ausflüge in die Berge machen. Essenstip in der Nähe Socca Tram. Die Kaution wurde nach einer Woche von FeWo-direkt zurück gebucht. Petit appartement très agréable et très bien situé! Nous avons beaucoup apprécié la bonne communication avec la propriétaire et l’excellente situation de cet appartement très agréable. Nous envisageons d’y retourner à l´occasion d’un prochain séjour! Lovely apartment in a quiet area. We found this apartment as an alternative to where we stayed last year in Nice and it was everything that we had hoped for. The apartment was close to the city centre but was also in a very quiet neighbourhood. It had everything anyone would require from a well equipped kitchen to a lovely bathroom and bedroom. The views from it were amazing especially at night when all the lights lit up the area seen from either the terrace or bedroom. Our host was really friendly and we got on from the first moment we met even though we turned up later than we planned. We hope to return to Nice and the apartment later in the year or early next year. Thank you Ghania. Thank you for your appreciations,i hope to see you again with pleasue.Ghania. 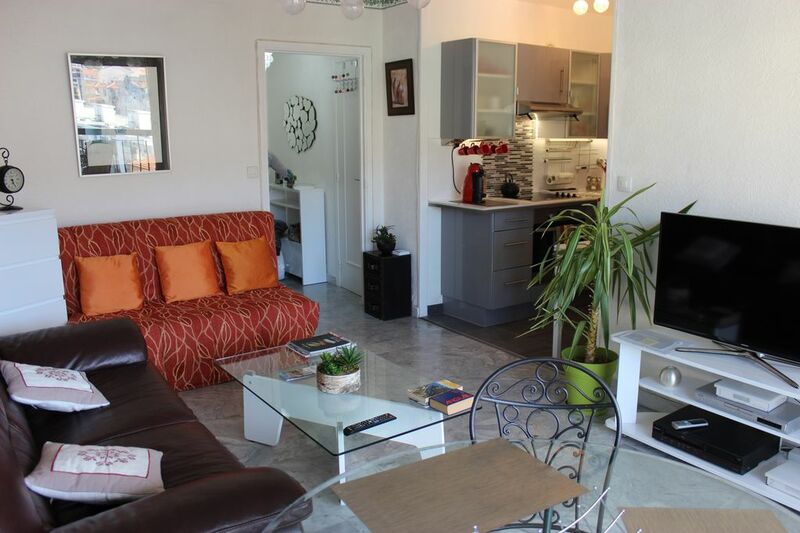 This is an excellent choice in NIce--we stayed in this apartment for 6 weeks during January and February. Our first priority is location and this apartment is perfect--a block from the bus that goes directly to and from the airport for the price of a bus ride (not the 45 Euros we paid for a taxi); two blocks from the tram the goes directly to the main train station and shopping area, old Nice and the Promenade; for runners, a mile on sidewalks then the perfect running place--the Promenade. We easily visited Cap Ferrat, Menton, Villefranche and other places by tram and bus. The apartment is two blocks from the daily (except Monday) large market where we got meat, fish and vegetables for our cooking and there are bakeries, cafes, restaurants and all the amenities within a few blocks. It is quite, comfortable and great for cooking in at night, but the real draw is the absolutely lovely view out the living room and bedroom over a small garden area and then up the hillside with the classic view of Nice and its hills. In good weather you can eat on the small balcony with this fantastic view. The apartment owner is very helpful--she gave great advice for our sightseeing. Thank you so much Margaret,i'm happy to see you again in nice.Ghania. Merci mr et mme Fournet pour votre commentaire que j'apprecie,j'essaye toujours de faire au mieux pour satisfaire les locataires qui viennent decouvrir notre region,au plaisir de vous revoir.Merci encore mme Adjaout.